Choir Bell is a Hunter Tool. The sound of this smaller, silver version of the bell does not cross planes, but grants vigor and healing to all cooperators." Invigorates all cooperating parties, healing them. Also cures ailments, ex: slow poison. Does not affect Frenzy buildup. Also heals Beast-Possessed Soul (Mob). Mergo's Loft. After defeating Micolash, Host of the Nightmare, use the Iron Door Key to gain access underneath the bridge connecting the two Cathedral Cradles. Cross the bridge and the bell is in a room with a chest, a few spiders and a Winter Lantern. Beware that this path puts you in danger of being frenzied to death by the Brain of Mensis. If you want to avoid the Brain of Mensis, you can ride the elevator that goes between the entrance and exit to Micolash's boss area. This elevator can be identified by its door, which is stuck open and doesn't close. There is an open window halfway up the elevator's path that you can jump into. This leads to a bridge with 3 Winter Lanterns. At the other end is a hole you can drop into to reach the room that contains the Choir Bell. Heals 440 health at base requirements (15 Arcane). Heals 733 health at 40 Arcane. Was lowered from 10 QS Bullets to 8 in Patch v1.03. Was lowered from 8 QS Bullets to 7 in Patch v1.04. Still usable while the player is affected by numbing mist. This bell's fashionable design and silver colored appearance, as well as being crafted by the healing church, mimics the real life usage of silver by various religions, Christianity in particular. Silver was considered precious and used often as a symbol of reverence given to God. In this sense, the healing church, upon discovering a bell that could heal others as well as the user, decided to craft smaller variations out of precious metal and used intricate designs for its appearance. A theory about the original bell this item was based on was that it may have been used to contact a Great One by the Choir. If this is the case, it would make sense why the smaller variations were designed with beauty in mind since one would want to show reverence to such a great and powerful being. Using the bell onto the injured Eileen outside Cathedral Ward kills her instead of healing her. It is speculated that this is to help keep the game's story intact (in other words, you cannot help Eileen out other than killing her mark for her). 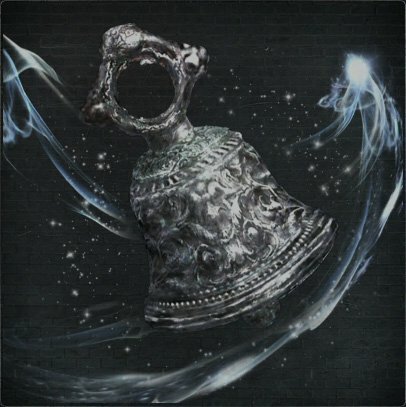 However, another theory holds that the bell's inability to heal Eileen might be the will of the bell itself, rejecting Eileen for possible moral grounds such as being a hunter of people or having committed countless assassinations. Why this does not apply to players who have committed similar deeds is uncertain, but the theory holds that being a hunter chosen by the dream could be a reason why. Didn&apos;t heal Father Gascoigne (as NPC coop for Cleric Beast) at all. Tried it two times, no results. My Arcane is 65 btw. This sounds cancerous, is it cancerous? 700+ hp at just 40 arcane? Anyone wanted good scaling with arcane will be going to 50 anyways... 70 for hunter tools... I feel like it might be cancerous. I think it should be made a secondary weapon, equipped on the left hand, reduce requirement to 10, scaling to B or C, increase range slightly, increase base heal to 500, make the animation less flashy by limiting the balls of light to the ground where they don&apos;t disturb anyone, reduce quick silver use to 2 or 3 maybe 4 and allow cooperater healing to scale with they&apos;re vitality stat but not with the users, even when healing himself since it&apos;s meant to heal others, I feel this item can awaken a new playstyle focused on support and I like the idea, maybe allow it to be enhanced by fortification and/or armor and/or a new type of blood gem, like a way to add new effects like increased fire resistance or faster stamina regen. 3. I looked down...That&apos;s death, that&apos;s a whole lotta death. Funny that this item can also effect npcs such as the doll and heals her. Does this do anything? Actual heal over ttime whle in co-op?? the requirement is now 15 arcane not 20. "This is a bell, a choir bell." Great Trivia. What it means by planes of existence and arcane was simply the sinsiter and small resonant bells, the beckoning bell and the old hunters bell. Some of the trivia comments were, well, just read what people said below. Had to include some religion information, but it&apos;s not hard to see that this bell looks like something you&apos;d see in a Roman Catholic Church typically. It isn&apos;t mentioned on the page, but does it have a specific range where it can work? I would assume so, but it&apos;s hard to tell when people are spamming vials and dodging.